Though there has been a marked diversification of many of the nation’s suburban school districts, this does not necessarily mean that suburban students are experiencing greater racial/ethnic interaction at the level of the individual school. Such interaction depends on which schools (and classrooms) suburban students of differing race/ethnicities attend. If suburban schools are highly segregated, with whites attending one set of schools and minority students a different set of schools, then minority student growth will not result in suburban white students attending schools with greater proportions of minority students and will not increase the exposure of white students to non-white students. To assess the degree to which suburban students of differing race/ethnicities share the same schools, we can examine the share of students who attend suburban majority-minority schools. Minority students in suburban school districts tend to be highly concentrated in majority-minority schools. 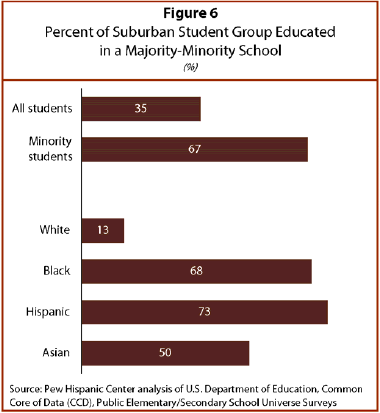 In 2006-07, more than two-thirds of suburban minority students attended a majority-minority school (Figure 6). Majority-minority schools educated 68% of suburban black students, 73% of suburban Hispanic students and 50% of suburban Asian students. Suburban majority-minority schools educated 13% of suburban white students. Thus the bulk of suburban white students attend schools that educate relatively few minority students. The extent of interracial and interethnic contact in American schools has been a landmark educational and social policy issue for decades. Broadly, at least three reasons have been advanced for why enhanced interracial and interethnic contact might be beneficial (Clotfelter, 2004). First, schools differ in their levels of resources and the quality of their teachers. They vary in the size of their student bodies, pupil-to-teacher ratios, per-pupil spending and curriculum offerings, as well as the training, turnover and experience of their instructional staff. When students of different racial/ethnic background do not attend the same schools, the potential exists that they also may not attend the same type of schools, i.e., schools of similar quality and level of resources. Though enhanced interracial interaction is not the only remedy to address differences in school quality, racial differences in school quality (at least at the school level, though not necessarily at the classroom level due to academic tracking policies) cannot exist if schools are racially balanced. Second, aside from differential access to school quality, the racial composition of schools may matter in and of itself. That is, there may exist “peer effects,” or minority students’ learning may benefit from having high-achieving peers. This is not asserting that minority students per se are low-achieving students because of their race/ethnicity. Rather it acknowledges that minority status is correlated with lower measured achievement (perhaps because of lower levels of parental education, lower academic expectations and other factors), and high test-scoring peers (who, on average, are white) may directly enhance student learning. In short, classmates may matter. Some evidence suggests that racial imbalances in peers have significant effects on minority student achievement (Hanushek and Rivkin, 2006; Harris, 2006). Third, in regard to the general principle of the desirability of racial/ethnic mixing in public schools, public opinion surveys reveal that adults by large margins support having America’s racial/ethnic mix represented in the student bodies of public schools (Elam, Rose and Gallup, 1996). Booming minority student growth in suburban school districts has increased the exposure of suburban white students to minority students. 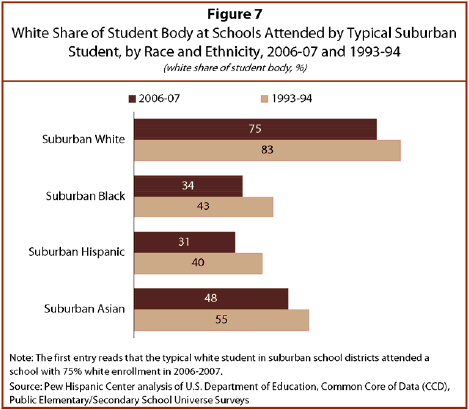 In 2006-07, the typical suburban white student attended a school that had 75% white enrollment. In 1993-94, the typical suburban white student attended a school whose white enrollment was 83% (Figure 7). Since 1993-94, suburban white students have become less exposed to white students and more exposed to minority students. Note, however, that the presence of minority students in the suburban schools attended by whites (25%) is much lower than the overall representation of minority students in suburban school districts (41%). And while the overall presence of minority students in suburban school districts has grown by 13 percentage points (from 28% to 41%), the exposure of the typical suburban white student to minority students has grown by only 8 percentage points (from 17% to 25%). In short, suburban school district racial/ethnic diversification has not led to a commensurate increase in the exposure of suburban white students to minority students. Though suburban white students’ exposure to minority students has not increased to the extent that the change in the aggregate racial/ethnic distribution might suggest, suburban white students’ exposure to minorities has increased more than that of the typical white student nationally. Town and rural school districts are the largest educators of white students (Figure 4), and white students in those districts have less exposure to minority students (attending 85% white schools) than do white students in suburban schools (attending 75% white schools). Reflecting the role of town and rural schools, the typical white student nationally attended a school that was 77% white in 2006-07, down from 82% white in 1993-94 (Appendix B Table B2). So suburban white students’ exposure to minority students has increased more than the typical white students’ exposure to minority students nationally. Though minority students have less exposure to white students in 2006-07 than in 1993-94 (Figure 7) does not necessarily mean that they are increasingly isolated in suburban schools. That is, suburban minorities need not necessarily be attending schools with students of the same race/ethnicity as themselves. Aggregate enrollment figures indicate substantial growth of suburban Hispanic students and, at the school level, suburban students of any racial/ethnic identity increasingly tend to have Hispanic classmates. Suburban black student isolation has only slightly increased. In 2006-07, the typical suburban black student attended a school that was 44% black, up from 43% black in 1993-94 (Figure 8). Suburban Asian students have experienced a small decline in isolation. In 2006-07, the typical suburban Asian student attended a school that was 23% Asian, down from 24% Asian in 1993-94. Suburban Hispanic student isolation has significantly increased. In 2006-07, the typical suburban Hispanic student attended a school that was 49% Hispanic, an increase from 42% Hispanic in 1993-94. For black and Hispanic students, suburban schooling increasingly resembles their schooling nationally. In 1993-94, suburban black and Hispanic students were less isolated in suburban schools than they were nationally. In 1993-94, the typical suburban black student attended a school with 43% black enrollment. Across the nation, the typical black student attended a school that was 54% black (reflecting the preponderance of black students in city school districts in 1993-94). As suburban school districts have gained market share among black students, black isolation has diminished nationally, from the typical black student nationally attending a 54% black school in 1993-94 to a 52% black school in 2006-07 (Figure 9).2 Because suburban black isolation has slightly increased, suburban schooling for black students has lost some of its distinctiveness in terms of lesser isolation relative to public schools elsewhere. Hispanic students have become more isolated nationally, but the increase in suburban Hispanic isolation exceeded the national increase, so that, again, the difference in Hispanic isolation between suburban schools and schools nationally has diminished. One of the most commonly used measures of school segregation is the dissimilarity index, which measures the evenness of the spread of students across schools in a school district. It ranges from 0 (complete integration) to 1 (complete segregation). Specifically, the index is the fraction of students in a group that would have to change schools for all schools in a district to have the same percent of that group as the school district overall. The index is usually calculated for areas that have at least a minimum population threshold. Table 7 reports an average of the dissimilarity index across school districts. Each school district needed to have at least 1,000 students of the particular group to be included in the average. An important facet of this analysis is that it is only capturing the evenness of students within a school district. 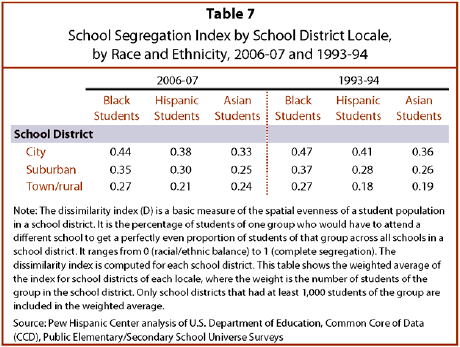 School segregation is often measured at the metropolitan level (Logan, Stowell and Oakley, 2002; Reardon and Yun, 2001). A metropolitan area often encompasses numerous counties and many school districts. Segregation across an entire metropolitan area can be decomposed into segregation between districts and within districts. This analysis measures segregation only within school districts. On the basis of the dissimilarity index, black suburban school segregation appears to have diminished since 1993-94. The suburban black value of the dissimilarity index declined from 0.37 in 1993-94 to 0.35 in 2006-07. Suburban Hispanic students appear to have become less evenly dispersed across schools in their districts. The suburban Hispanic value of the dissimilarity index increased from 0.28 in 1993-94 to 0.30 in 2006-07. Suburban Asian school segregation declined from 0.26 in 1993-94 to 0.25 in 2006-07, according to the dissimilarity index. Although the isolation measure and dissimilarity index are capturing different dimensions of school segregation,3 they generally present a consistent trend for understanding recent changes in the composition of suburban schooling. Suburban Hispanic students are increasingly less evenly spread across the schools of many suburban school districts, and suburban Hispanic students increasingly have less potential contact with non-Hispanic students. For Asian and black suburban students, there has not been a large change in their exposure to students of other race/ethnicities or in their dispersion across suburban school districts. Like all suburban students, Asian and black students have less opportunity to interact with white students. At the district level, black students tend to be the most segregated minority group (according to the dissimilarity index), and the school districts with the highest measured levels of segregation tend to be in the South and Midwest (Table 8). Districts in Miami-Fort Lauderdale, Atlanta and Baltimore display high levels of black segregation in 2006-07. 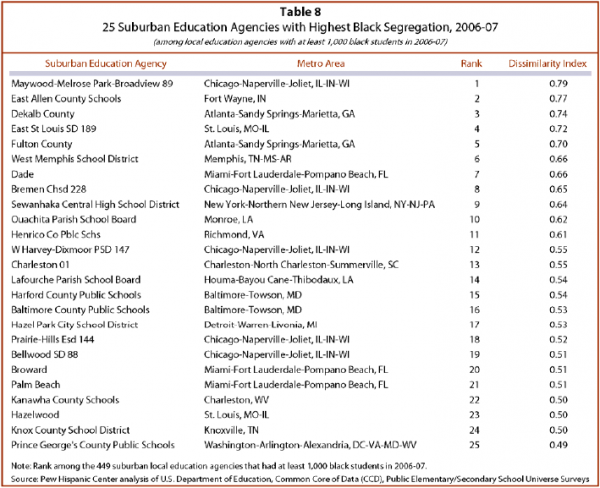 The 25 most segregated black school districts in the country also include numerous districts in the Chicago area and two in St. Louis. 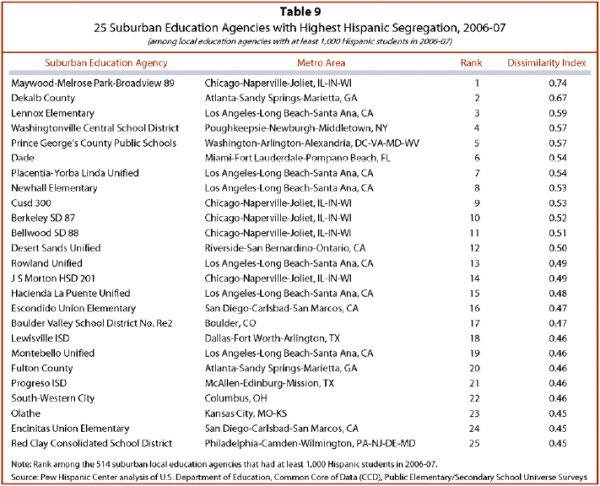 The most segregated Hispanic school districts (Table 9) tend to be in the West and Midwest. Six of the most Hispanic segregated districts are in the Los Angeles-Long Beach-Santa Ana metropolitan area, and two are in the San Diego area. Five districts in the Chicago area demonstrate high levels of Hispanic segregation. 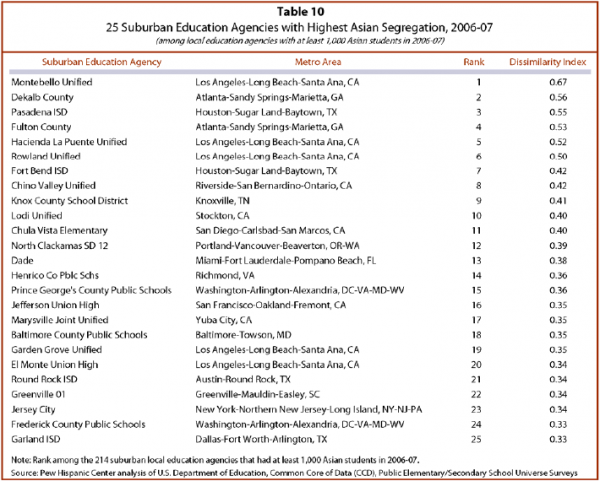 Virtually all of the 25 most segregated Asian suburban school districts (Table 10) are in the South and West. Numerous school districts in the Los Angeles-Long Beach-Santa Ana area and other metro areas in California report higher levels of Asian dissimilarity. In the South, Asian students are unevenly spread among schools in suburban school districts of Atlanta, Houston and Washington, D.C. The Prince George’s County public school system outside Washington, D.C., is a large suburban school district that has relatively high measured levels of segregation of each of its black, Hispanic and Asian student populations.